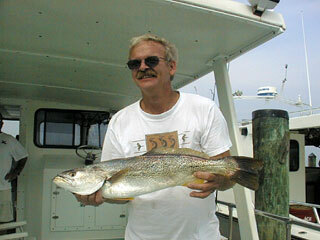 Trout continue to dominate our fishing activities as we approach the end of October. 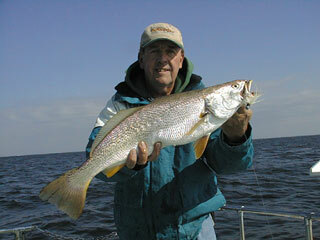 We tell everyone that sometime in October we'll fish for seatrout in earnest, but we've not seen large yellowfins like these in a number of years. 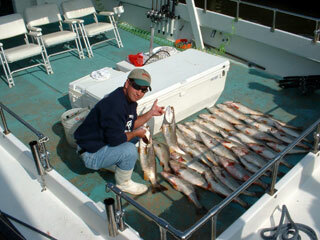 These trout up to 26 inches were caught by the Ed Smith crew of October 27, along with a good bunch of blues and a limit of rockfish. It doesn't get much better than this. 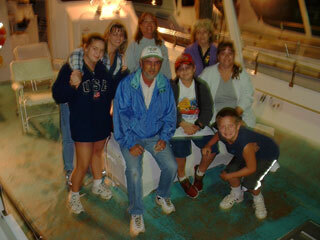 And here's the Ed Smith crew. 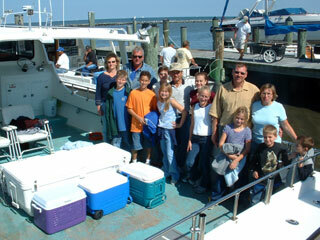 From left to right, that's Gary, Christy, George, Ed, Brian, Connor, Danny, and Amanda in front. For more photos of the Smith crew, click here. 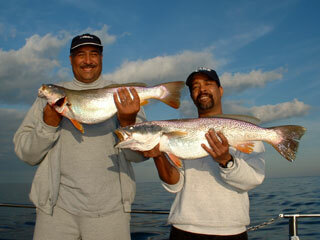 Here we have Tony Gillis (left) and Ron Edmonds with a couple huge yellowfin trout to 28 inches, caught while trolling October 26 on the Worm. 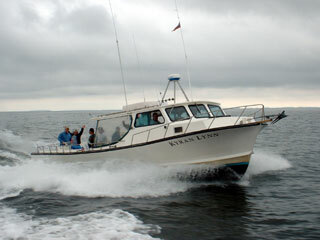 For more photos of the Edmonds crew, click here. 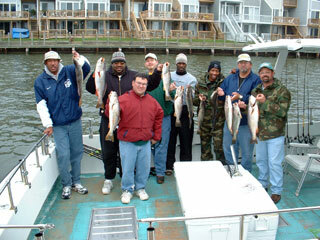 And here we have the Lance Weakley crew (3rd from left), shown with a good bunch of big trout they caught October 26. 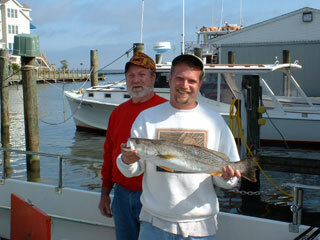 Here's Lance with a beautiful yellowfin and his dad Leonard in the background. 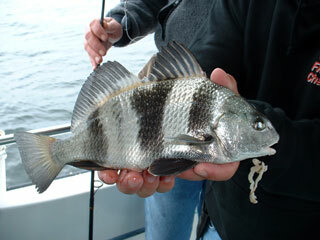 We think this little guy is a small black drum, which was caught while we were chumming for rockfish in deep water. 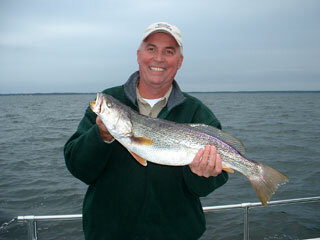 And here is Randy Eckley of Green Contracting, shown with a big yellowfin trout he caught October 25. For more photos of the Green Contracting crew, click here. 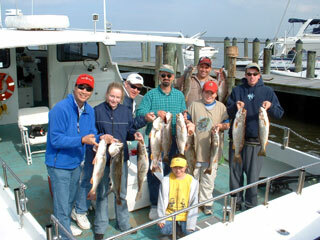 And here we have the Peter Charney crew from October 25, shown with some of their awesome catch of big seatrout. Click here for more. 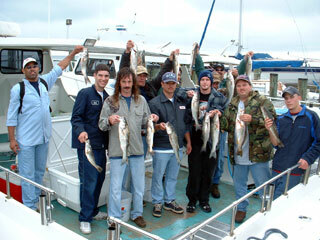 Here we have a crew sponsored by North Bay Distributors and led by Cory Derfler (far right), shown with part of their catch of rockfish from October 20.
and shown here back at the Dock. 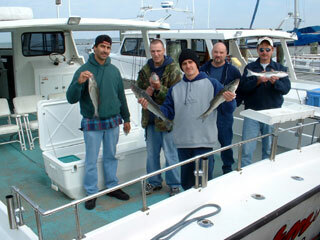 And here's the Bill Cruz (left) crew from October 17, shown with part of their limit catch of stripers. From left to right, that's Bill, Mike, Billy, Dave, and Hop. 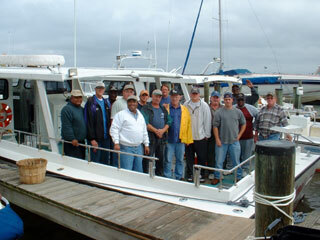 Here we have part of a multi-boat trip on October 13 with crews from Koons Toyota of Annapolis, led by Mike Burrell (fourth from left). 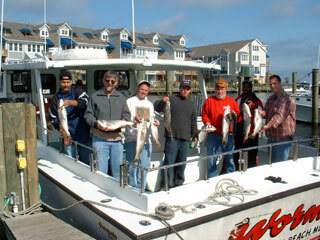 After catching their limits of rockfish, they did pretty well jigging for seatrout to 24 inches. 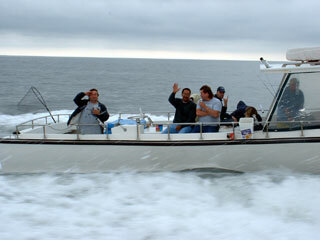 ... shown here on the way back to the Rod 'N' Reel Dock. 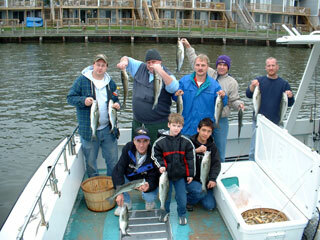 And Mike's crew once again, shown with some of their fine catch of stripers, blues, and seatrout. 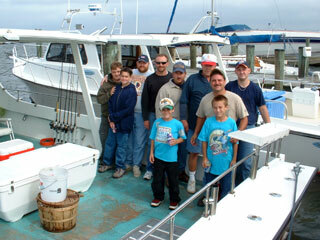 And here's the Rodney Koontz crew, who fished on the afternoon of October 13 on the Worm. Here's a crew from Rhodia Inc., led by Troy Fulwiler (3rd from right, front), after catching a good number of stripers and a few blues on October 12. 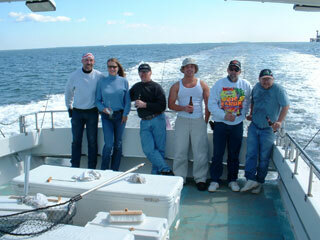 And here we have the ringleaders from Otis Elevator on a multi-boat charter on October 11. 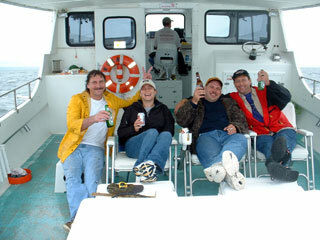 From left to right, that's Tom, Jill (crew chief), Jeff, and Shawn. 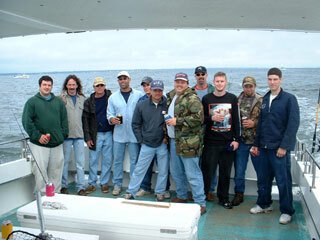 Here's the Cindy Pleu crew from October 6, shown after catching a good bunch of bluefish and lots of small stripers. 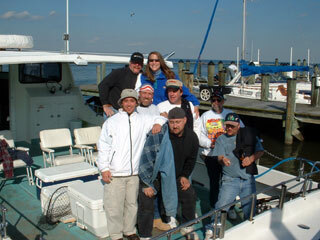 And here's Mr. Todd's crew from the morning of October 6, after catching a bunch of blues and rockfish. 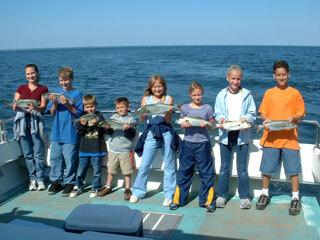 Here's a closeup of the younger anglers in Mr. Todd's crew, showing off some of their catch. 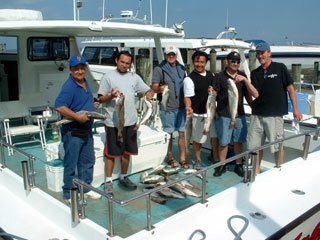 Here's a crew from North Bay Distributors, led by Mike Fox (far right) on from October 5, shown with a fine catch of bluefish and nice sea trout up to 26 inches.